When thousands of bicyclists took to the streets of San Francisco Friday night, they had more history to celebrate than most of them knew. The mood remained mostly festive throughout the evening, but organizers said they wanted to make a statement -- much as they did 20 years ago, in the Critical Mass ride of 1992, and 96 years before that. That's right, bicycle protests have been going on in San Francisco approximately since the origin of the bicycle. And as Hank Chapot recalled in Processed World magazine, the barely remembered protest of July 25, 1896 may be been the most important. So we thought it would be helpful to draw a brief comparison of last weekend's event, and the one that started it all. 1896: Bicyclists (wheelmen as they were called then) wanted improvements to city streets. The biggest concern then was that Market Street was poorly paved, and most other streets had no pavement at all. Bicyclists also complained about getting their wheels caught in streetcar tracks and cable car slots. The San Francisco Call newspaper reported on the great bicycle rally of 1896. 2012: Bicyclists still want improvements to city streets, particularly Market Street. Pavement is taken for granted, but bicyclists are still getting their wheels caught in streetcar tracks, sometimes with deadly results. The San Francisco Bicycle Coalition advocates a separate path for bicycles, physically separated from motor vehicles. 1896: Wheelmen and wheelwomen came from all over the Bay Area, many of them members of bicycle clubs, such as The Bay City Wheelmen and the YMCA Cyclers. The umbrella organization nationwide was the well-organized League of American Wheelmen. 2012: Bicyclists came from all over the Bay Area. Though Critical Mass has no official leader, it does have a website. Organizations like the San Francisco Bicycle Coalition have helped represent concerns of cyclists to the city government. There were also a good number of women, in bloomers, defying the dress code of the day. The parade ended in rallies with bonfires and political speeches. 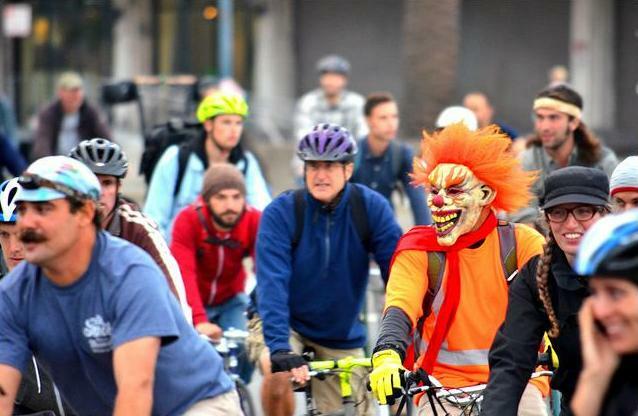 2012: Friday night's ride included at least one naked man, masks, face paint, trailers, double bikes welded on top of each other and many other colorful costumes. 1896: The big enemy in those days were the streetcars. The crowd threw blocks of wood at streetcars trapped in the mass of riders, smashing their windows, and rocked the vehicles back and forth trying to overturn them. 2012: Riders gleefully snarled traffic downtown for several hours. Still, the atmosphere remained calm compared to some of the monthly Critical Mass rides of the 1990s, particularly 1997 when cyclists were accused of denting, scratching and smashing the windows of various motorized vehicles, and motorists were accused of intentionally running into riders. 1896: Market Street, and the rest of San Francisco, eventually got asphalt, literally paving the way for the motor vehicles that have since become bicyclists primary competitors for space on the streets. 2012: Bicycle activists are still arguing about the role that Critical Mass has played in getting more bike lanes and other bike-friendly additions to San Francisco streets. The ride on Friday was mostly commemorative, but it generated a lot of enthusiasm for renewed activism.